Yesterday was the first day of school for my oldest son. This new change in my mornings has upended my breakfast routine again and I am determined to keep the good habits I developed over the summer. It seems that when my son is in school it is a crazy rush in the morning to get everyone in the shower, dressed and out the door by 7:30 for the bus. My youngest is not a morning person by any means and normally complains and won't eat breakfast until an hour after he wakes up. During the summer that works fine since he can wake-up when he wants and eat whenever he feels he wants to. However, during the school year this schedule doesn't work and my son grumbles all the way to drop his brother off at the bus. When we get home I like to have something quick and filling for him to eat that can be put together in minutes. In order to achieve this I do a lot of my baking in the evening and one thing that I have found that works very well for busy mornings is muffins. Recently, I tried a new recipe for Quinoa Muffins from Martha Stewart Living, which looked full of whole grains and perfect for a rushed morning. This recipe has 10 ingredients. It takes a total of 1 hour, 25 minutes of which is prep and makes 12 muffins. Obviously I made one major modification to this recipe. 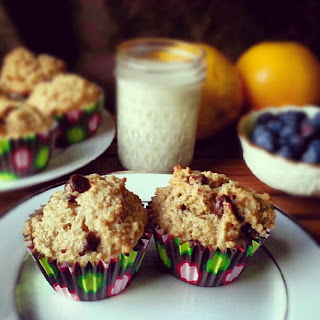 While I loved the idea of quinoa muffins, my boys and I aren't big raisins fans. So instead of raisins I substituted chocolate chips. I also used closer to 3/4 of a cup of chocolate chips, I love anything with lots of chocolate. Since I don't have a dishwasher and find cleaning muffin tins to be tedious, I chose to use muffins cups instead. There are some great muffin cups available now and they look great when served. My overall baking time was slightly longer than the recipe suggested and I turned my pan 90 degrees halfway through baking to ensure even browning. I followed the remainder of the recipe as written. I don't think these muffins lasted more than a day in my house. They were delicious and I love that they are full of whole grains. My oldest son has fallen in love with quinoa and loves it in waffles, cereal, cookies, pretty much anything that I can bake. This recipe was very easy and the addition of chocolate chips was perfect. I would definitely make this recipe again. For the recipe go to Chocolate Chip Quinoa Muffins. I had no idea what quinoa is, but these muffins look delicious! I used to eat muffins before school all the time. Wish your son luck on his first week of school! Quinoa is a great grain, it works in so many recipes :) So far my son's first week of school is going great! These look so good!! Thanks for sharing the recipe. Oh my goodness those look amazing! Thanks :) They really are great and full of whole grains! Those look Yummy! Makes me want to give quinoa another try! I've been looking for ways to introduce quinoa to the family and it looks like this will be just the trick! Thanks for sharing! I found this post on Thoughtful Thursday, have a great weekend! I don't think they'd last long in mine! Thanks :) They really are yummy! I've been wanting to try quinoa but I wasn't sure how to get my family to eat it. This is perfect! Totally pinning this recipe! It really is a great recipe and my two boys loved it :) Tell me if you try it and what you think of it! Another reason to use quinoa more often- thanks for sharing and linking up at Sweet Saturday! Quinoa is a great grain, I love it! Yay!!! You won a feature from last week's Super Link Party! Thanks for the feature, added it to my sidebar :) Thanks for hosting!